It Came From Youtube: Corey Feldman's First Live TV Performance...With A WWE Legend - WrestleCrap - The Very Worst of Pro Wrestling! Poor Corey Feldman. Last Friday, the former child star of such 1980’s classics as The Goonies, Stand By Me and Friday the 13th Part IV: The Final Chapter broke out his microphone and Michael Jackson-inspired dance steps for a live musical performance on the Today show. Well, I’m not here to make fun of Corey today. No sir, no ma’am. I’m here to take you back in time to 1992, to a live performance that comes nowhere near his recent Today show one in regards to bizarre. It comes nowhere near it, because it is one of the weirdest/greatest things I have ever seen and it totally blows away “Go 4 It” in terms of wackiness. 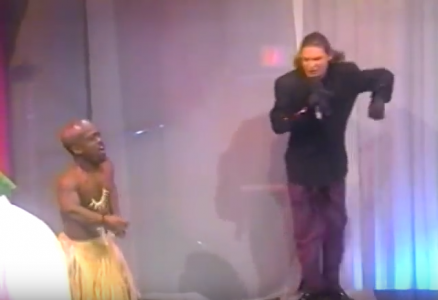 From Howard Stern’s Channel 9 show (on a wacky night when Howard was dressed as the lead singer of Right Said Fred), here’s Corey performing “What’s Up With The Youth,” featuring his main backup dancer, the legendary WWE midget wrestler, the Haiti Kid!!! OK, now I’M crying. Crying because you, me, and the entire world never got to see the Haiti Kid shaking his money maker in a hula skirt alongside Corey Feldman ever again. 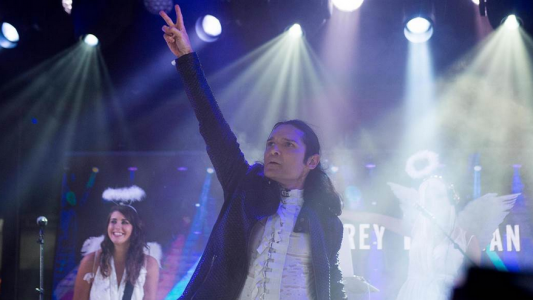 9 Responses to "It Came From Youtube: Corey Feldman’s First Live TV Performance…With A WWE Legend"
We’ll never get to see Haiti Kid hit ’em with the Hein. 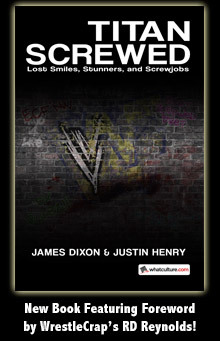 I miss the old WOR show, glad I videotaped a few of the shows including this one. It was such a great trainwreck to watch it actually made me stay home on a Saturday night at the then ripe age of 21. Well at least stay home till the show was done ahhh the golden days of youth. Such a glorious trainwreck. I was at a comic convention and saw a vendor selling a bootleg dvd set of the complete Channel 9 show series. I was short on funds that day, but hope to snag it next time. There’s a youtube channel that has every episode. Now I’m going to go back & watch The Head Injury Club For Men with Gary Busey. I feel that Obsolute Mule Jeff Hardy or actually a Corey Feldman gimmick. WOR. Wow. Mets games. Howard Stern. Morton Downey Jr. Richard Bey. Late 80’s good times. Easily the most talented entertainer of our time.